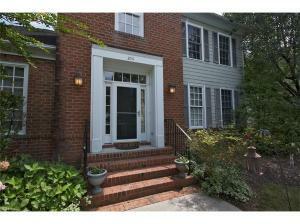 Lovely 3br, 2.5 bath home in Brandywyne subdivision in Williamsburg. Very nice first floor master with ensuite bath and hardwoods. One of the larger dining rooms in the neighborhood it is open to the family room and the kitchen. Kitchen features plenty of cabinets and counter tops to prepare that gourmet meal. Features also include an eat in area in the kitchen and a large family room with fireplace all on the first floor. Hardwood abound! There is a nice rear porch for grilling and relaxation also. Upstairs you will find two large bedrooms with a hall bath to be utilized by both bedrooms. Storage galore which is walk in! You will also find great garage and off street driveway parking. Your view is the best overlooking the subdivision! Convenient to I-64 and the Colonial area. Many walk from this location into Williamsburg City. Call for a private showing.